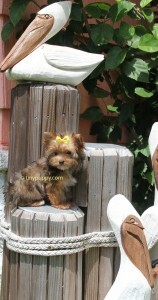 This tiny little Yorkshire Terrier puppy is MICRO Milky Way! He is a doll, as you can see. He only weighs 2.4 lbs and will be 5 months old on Halloween. Milky Way truly Smiles for the Camera as you can see! Not only does he look like a happy puppy but he is a HAPPY PUPPY! 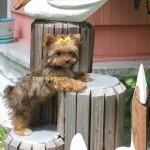 Milky Way loves playing with others big or small and loves being held even more! 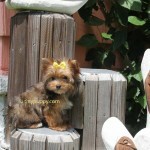 His mother an AKC Championship Bloodline Parti Yorkie is just 4.5 lbs. 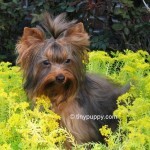 His mother and father are both AKC registered with champions in there Bloodlines. 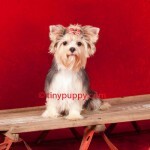 Milky Way’s Mother has the gold gene and is a Parti Yorkie. 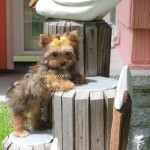 Dad is a Golden Sable Yorkie with Chocolate and Black and Tan bloodlines. Dad weighs 3.2 lbs. Both are Beautiful. We fly with our puppies to deliver them. Nanny on board.